I hope you had a wonderful week and that Spring has arrived in your corner of the world. Not so lucky for us; I think we got at least 45cm (a foot and a half) of snow this last week and it is still snowing as I'm writing this post. Looking to the bright side - all that shovelling will help tone my arms up for summer and burn the calories from the Easter eggs. It is Friday so a new Playing in Paradise challenge begins today. A big thank you to everyone who took part in last week's challenge! I loved seeing all your favourites. This week, the talented Linda is hosting and she has chosen banners as the theme. As always, everyone is invited to take part and you can create anything you like using any supplies you fancy. I hope you will join in the fun! The project I had initially planned for this challenge didn't come together in time, so I ended up making a quick and easy gift card holder instead. The idea for this 'wallet' style holder came from a magazine, but I made a lot of changes to the dimensions and design. Stitching - Even though I have a sewing machine, I did all the stitching around the edge by hand. I find it easier to get a nice straight line. I use my TH ruler (which has perfectly spaced wholes in it) and a paper piercing mat to pierce all the wholes before stitching. Other - edges of the DP were inked with yellow Colour Box fluid chalk. Ribbon and pearls. If you haven't already, pop by the Playing in Paradise challenge and check out the beautiful projects made by our DT and guest designer. Then get crafting and join in the fun! Thanks for visiting and for taking the time to leave a comment. I love reading them and having the chance to visit you back. Last but not least, a big welcome to my newest followers! I am so happy to have you along. What a great idea, I will make a note of how to make this holder, it's so neat and pretty. This is gorgeous Dawn. I love the design, with a beautiful image and papers. I so hear you on the snow - second round for us this week, although we haven't hit your amount yet...and I'm hoping we don't! Dawn I love this design! Love the yellows! Perfect for spring however it has not showed up here yet! Burr it was 23f here. 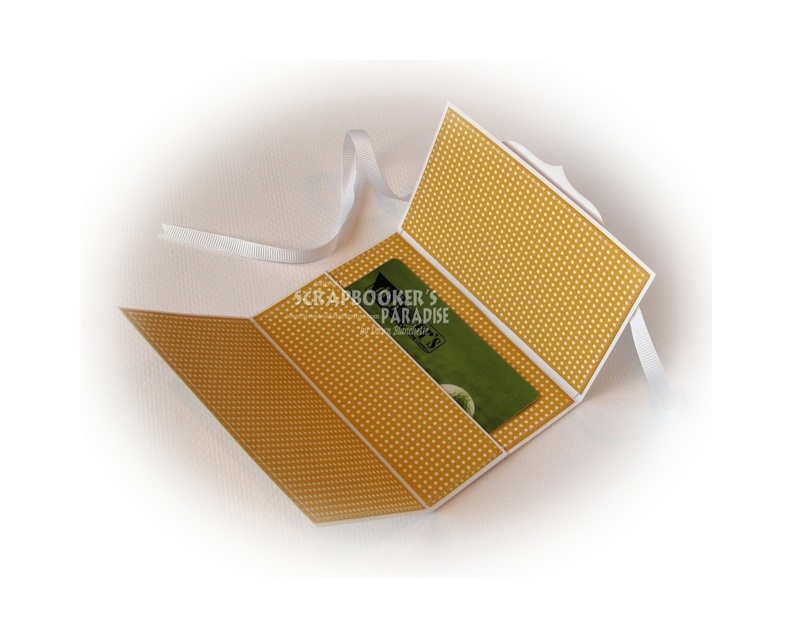 Useful and pretty, a gift card really does seem to be the way to go these days. Thank You for this. Keep smiling and creating. 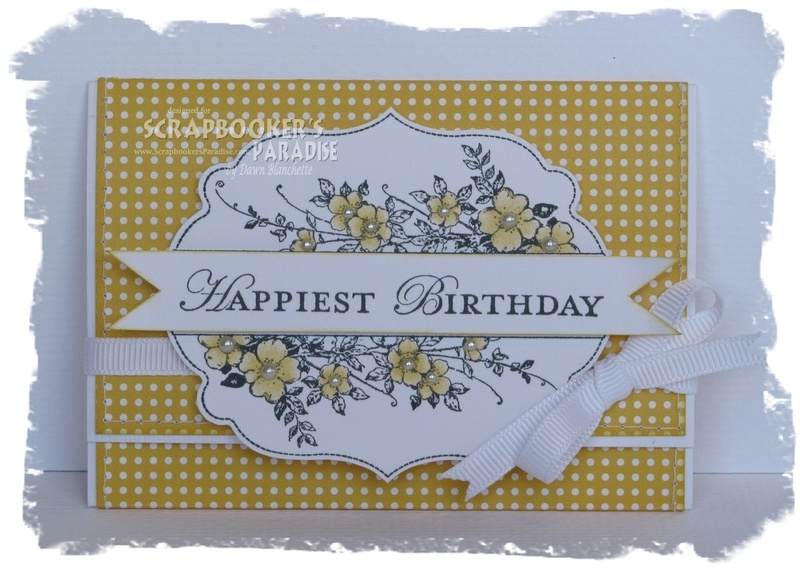 Very pretty card Dawn, I love the bright sunny yellow and beautiful image. I'm always looking for new ideas for gift cards Dawn. This is just gorgeous! I love how you made the greeting into a banner! Will definitely be "pinning" the instructions! 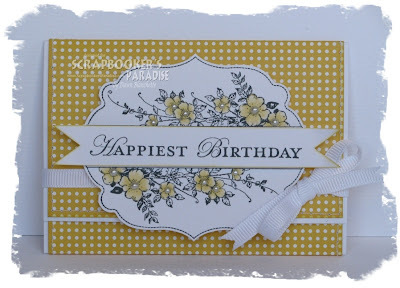 Pretty card and love the sweet colours. Lovely idea with the pocket inside !